and makes it seem to lose weight in a fluid. (Remember, a fluid means a liquid or a gas). The upthrust, or buoyancy, keeps ships afloat. The upthrust, or buoyancy, keeps swimmers on top of the water. Things weigh less in water. 1. 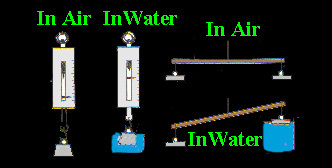 The balances show the same weight in air and in water. 2. The ruler shows equal weights at each end, in air and again in water. 1. You should see that the weight shown by the balance where the weight is suspended in water is less. 2. You should see that the ruler is lower at one end than the other. The apparent loss in weight is caused by the buoyamcy of the water.